Never lose an opportunity to be remembered with social media business cards. How many times have you passed out a business card with your company name, website, social media icons, contact information, and photos that highlight your products? The number is pretty high, right? It should be. Business cards are a way to connect. They connect you with customers, both new and old. They connect you with business partners and networking contacts. Now they can connect you in a new way: through social media. Along with all of the business card basics, your company’s social networking icons and URLs can be a smart piece of information to include. More than just your website, these sites encourage engagement and interaction between customers and company representatives before and long after they make a purchase. Happy customers are your best advocates and supporters. They like to tell people they know about their experience with your company. If you supply them with a business card they can pass on, you have just created an instant channel of communication to new customers that you might not be able to reach otherwise. When you include social media icons with a short line of copy inviting them to join you on your social media channels, you make that business card act as a social networking tool. When you design your business cards with this new customer communication channel in mind, your cards will evolve into social media business cards. Every time you network, whether with a business partner or professional association, each person should be handed a business card. When done correctly, it will tie into your conversation’s goals and reinforce meeting you in person. By giving out your contact information, you also show that you are interested in keeping communication open for a relationship with them in the future. Not everyone keeps paper and pen on them at all times these days, so being armed with a dozen or so printed business cards will make sure you never lose out on an opportunity to be remembered. 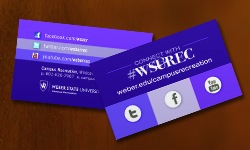 Your business cards help keep your company in the conversation, both in social and the business world. With them, your customers and networking contacts feel closer to you and your company. When you goal is bringing these customers in, you can make them feel as important as every employee on your team, by starting this two-way communication with them. We are committed to helping your business stand out from the crowd and gain a competitive edge when choosing our custom business cards to print for your company. Our knowledgeable customer service representatives are happy to answer any questions about printing your project! Close every business opportunity you connect the right way!